Kiwi is king of all the fruits. Over the years, I’ve compared all the fruits with each other and the kiwi always comes out supreme. Even so, fruit has nowhere near the overall nutritional value of veggies. Mostly, I see fruit as a healthy candy. Although, it’s true that each variety usually wins high honors in a few nutrient categories. The amazing thing about kiwi is how it even surpasses many a veggie on this score (1). Watch out though, if you plan to eat scores of them daily. 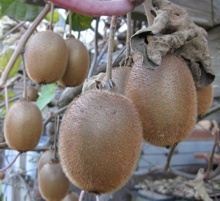 The kiwi contains a lot of papain that really tenderizes your mouth meat. Papain, an enzyme also present in papaya, breaks down tough meat fibers; it is sold as a component in powdered meat tenderizer. The kiwi has a few other wonders up its fuzzy sleeve too. I’ve grown them for decades now and never found an insect or disease on them. Is it the papain? I never water them and in California, that means 6 months without rain. They are growing on river bottom soil here, which may explain that. They produce copiously and are ready to pick around Christmas. The only other fruit that’s ripe and ready here in winter are oranges and lemons. Finally, their vines provide great shade in summer and shed leaves in the fall to let sunlight in. I have my kiwi on a trellis over the compost area which keeps it shady in summer (a good thing), and beautifies that space as well – not that compost isn’t beautiful mind you! Hmm, I should apply for a job at a kiwi promotional company. It would be a lot easier to promote than Taoism. (1) This table first shows the nutrients in 3.5 oz of kiwi, next the nutrients in 7 lbs. of kiwi, which is the amount you would need to eat to get the necessary (more or less) 2000 calories per day. The surpluses here are based on the 7 lbs. of kiwi. Of course, you’d not want to eat only kiwi for your entire caloric needs. Comparing nutrients as though you were just going to eat 2000 calories worth is the best way I’ve found to see the nutritional ‘big picture’. Thanks, Carl. I’ll give that a try. What’s the best way to peel ’em? I like them and they are good looking in a salad, but peeling can be a pain. Kiwi must be the llamas of fruit. Llamas, too, are very disease-free; must be the smelly spit stuff!